For the ninth year in a row, The Daily Reporter on Thursday honored its Newsmakers of the Year at an annual awards dinner. This year’s winners included Michels Corp. for Road Builder of the Year, C.G. Schmidt for Builder of the Year, and Wangard Partners Inc. for Developer of the Year (see below for a full list of winners). 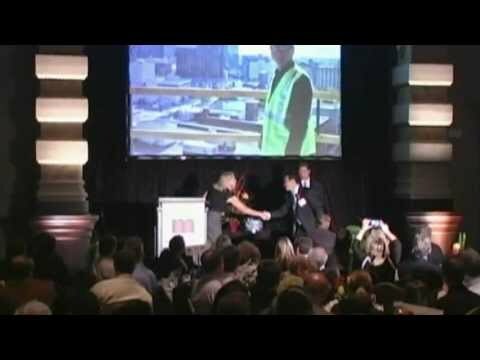 Twenty-two companies, individuals or groups were honored at the celebration, held at Milwaukee’s Grain Exchange. For the second year, The Daily Reporter paired with WasteCap Resource Solutions to present four green award-winners, recognizing remarkable commitments to sustainability. New this year were two Small and Disadvantaged Business awards, done in partnership with KPH Construction and the Emerging Construction Business Incubator. Matt Rinka, Rinka Chung Architecture Inc.
Mike Hoadley, C.G. Schmidt Inc.
Dan Neve, Staab Construction Corp.
Wally Wellenstein Jr., Wellenstein & Sons Inc. Rob Weise, M.A. Mortenson Co.
Michael Hacker, Bray Associates-Architects Inc.
Roberta Oldenburg, M.A. Mortenson Co. Tagged with: Bray Associates Architects Inc. C.G. Schmidt Inc. City of Milwaukee Coalition for the St. Croix River Crossing Faith Technologies Inc. M.A. Mortenson Co. Matt Rinka Michels Corp. Rinka Chung Architecture Inc. Rob Weise VJS Construction Services Inc. Wangard Partners Inc.